How you react to this film will have a lot to do with your expectations. For a variety of reasons, I had mixed expectations for this raunchy comedy. But I still had faith in director David Dobkin. Yes, I liked “Wedding Crashers ” that much, and I’m eager for his next project. OK, I’m drifting. The facts: Jason Bateman and Ryan Reynolds go crazy cuckoo, but will not win an Oscar nod as Dave and Mitch, two friends who switch bodies. How you may wonder? By peeing in a fountain one night, and wishing they could trade places. It’s one long pee…but the spell is cast. Cheesy, I know, but what the heck. The whole movie is just an excuse for Bateman and Reynolds to show their true colors as comedians. But it’s also the perfect excuse for laughs that come fast, fat and raunchy, as Dave and Mitch get to enjoy each other’s bodies. Sometimes it works, sometimes it doesn’t. 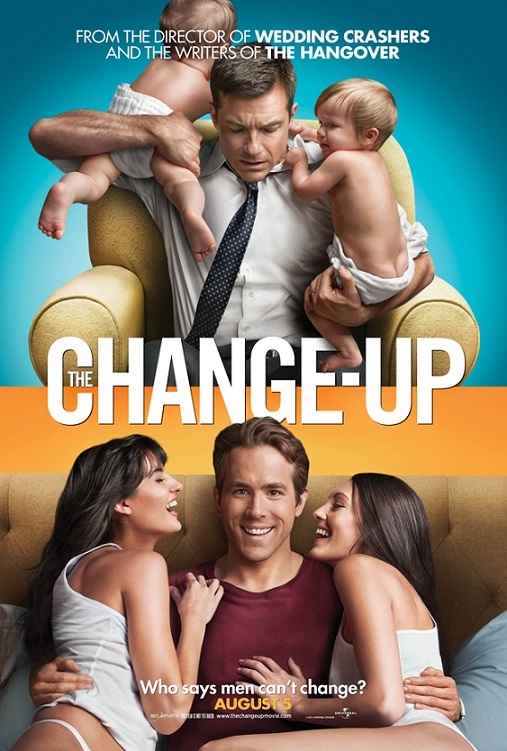 No matter, I think you might enjoy “The Change Up”, at least for a while, before it grows wearisome as the plot moves along, seemingly unaware that it has played all of its cards. Notice how Hollywood plays it safe, by resorting to cheap toilet jokes. One disgusting poop scene involving Bateman and his twin babies is followed by another, 30 minutes later. That’s two too many. Despite a pair of live wires in the lead, “The Change Up” is just not enough.